I’m pretty sure you are all in a pretty similar boat to the one I find myself in right now. The schedule is wild and I find my proverbial oars going as fast as I can paddle them. The Nutcracker, choir concerts, end of semester activities, school work, family and work obligations… they all add up to one giant marathon of getting-it-done. 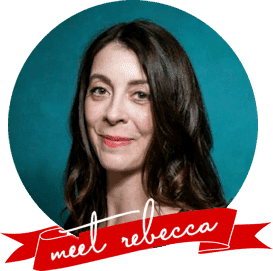 I don’t like to rely on take-out food both because I don’t actually feel up to snuff on a steady diet of restaurant fare and because my budget would be strained to the max if I tried to feed our family of 7 that way. It just isn’t going to happen. 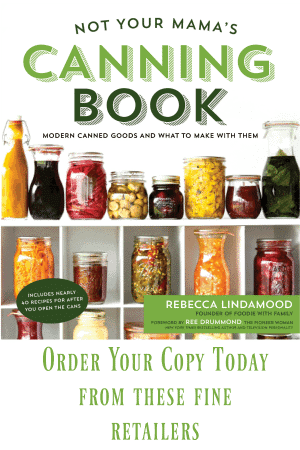 What that means is that I need a good cache of recipes that are quick to assemble, easy to plan for, make a large quantity, reheat easily, and feed a crowd. It isn’t impossible, though, I have collected quite a few of those over the years. 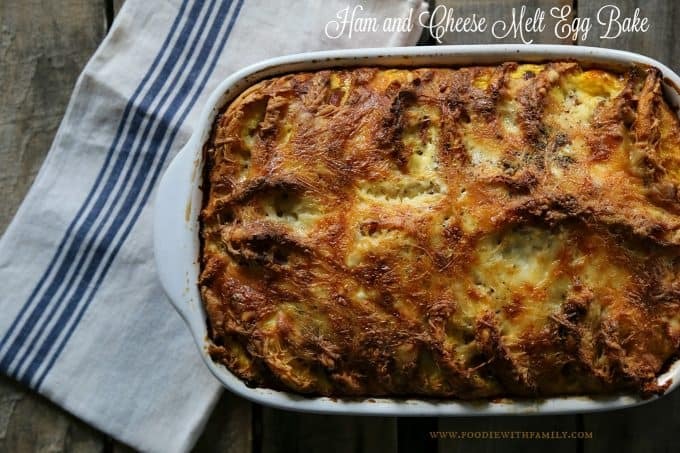 Today’s Ham and Cheese Melt Egg Bake is a perfect example of what I mean. It is almost embarrassingly easy to throw together, doesn’t require any exotic ingredients, can be prepared ahead of time, reheats like a treat, and pleases all the palates that I am in charge of feeding three meals a day plus snacks. That’s a win/win/win/win/win in my book. What’s the deal? This is what the chi-chi would call a breakfast strata. I grew up calling this sort of dish an egg bake, though, and so in my book, an egg bake it will always be. It’s a simple concept. You use stale bread, layer it with meat or vegetables, beat together a few eggs, some flavourings, and some milk, pour it over the top, and add some grated cheese for good measure. 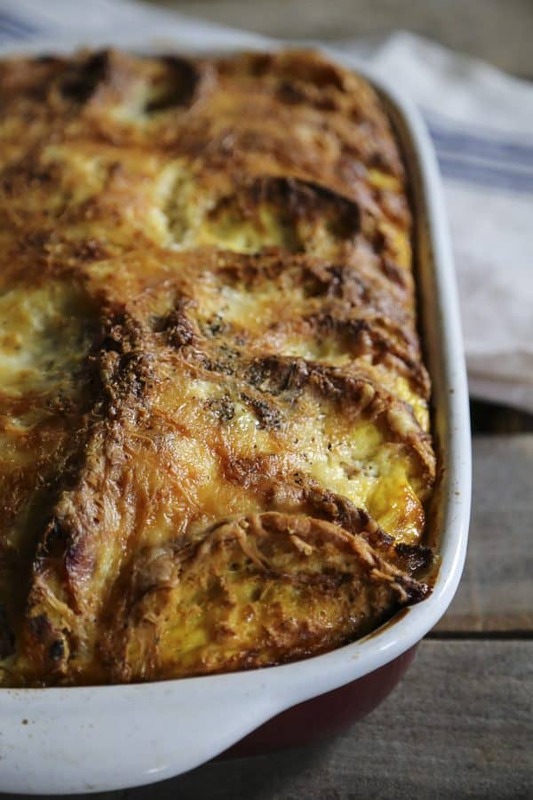 It’s a bit like a savoury bread pudding, but a bit more substantial. Ham and Cheese Melt Egg Bake takes it a little further, though, using Canadian bacon for the ham and toasted English muffins as the bread component, making the egg bake taste reminiscent of ham and egg breakfast sandwiches. You can see how this is a happy marriage of breakfast stalwarts, right? It has that crisped, toasted cheese top and crust around the sides and a perfectly fluffy, souffle-like, never-dry center. It’s the Mary Poppins of breakfast bakes in my book; practically perfect in every way. In case that isn’t enough to convince you, consider the convenience of the whole shebang. You arrange your English muffins and Canadian bacon in alternating layers in a casserole dish and throw some grated cheese on, beat your eggs and milk together and pour it over the works, cover the pan, and stash it in the refrigerator overnight (anywhere between 6 and 12 hours). Set the pan on a rimmed baking sheet and let it rest on the counter while you preheat your oven, then bake it for about an hour and a half. Tada! Brunch is READY. Finis! And you didn’t even have to think about anything other than shuffling downstairs in your bathrobe and preheating the oven. I’m going to have a Captain Obvious moment, here, and point out that -as you may have noticed from the timeline given above- you can whip up the pan full of goodies in the morning, pop it in the refrigerator for 6 to 8 hours, and bake it up for your evening meal. Serve it alongside a big green salad and you have a meal fit for a king! Permit me one more little suggestion? Imagine waking up Christmas morning and popping a pan of Ham and Cheese Melt Egg Bake into the oven that you prepared before snuggling up in your bed with visions of sugarplums on Christmas Eve. Can you almost smell the enticing aroma of baking ham and toasting cheese drifting your way as you watch the kids open gifts under the tree? Or if it is just you and your sweetie, think of the delicious temptation of smelling that while you go about your morning routine. Yes, this recipe is a big one. Yes, it yields a LOT. The beauty of this, though, is that for a large family like mine, it yields enough for breakfast for at least 2 days. If you feel like there’s just no way your family can make it through a pan full of this before it goes off, you can certainly halve the recipe, putting the contents into an 8-inch by 8-inch pan and baking for about an hour or until it is fully cooked. Need a clue on how to tell whether it’s fully cooked? The most foolproof way to know whether your Ham and Cheese Melt Egg Bake is fully cooked is to use an instant read thermometer and pull the egg bake when it reaches 157ºF. This is similar to the one I own and I swear by it. If you don’t have an instant read thermometer and don’t want to or can’t buy one, there are a couple of cues you can look for to help you know whether your Ham and Cheese Melt Egg Bake is done all the way through. It should look well browned and puffy in the center. The center should not jiggle at all, and when you insert a sharp knife into the center, it should feel firm and the blade should come out clean when you pull the knife back out. If you’re seeing uncooked egg on your knife blade, you need to return the egg bake to the oven for a few more minutes. 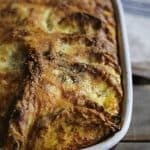 This prepare-ahead egg bake tastes much like a classic ham, egg, and cheese on English muffin breakfast sandwich because it pulls all of those components in a souffle-like savoury strata or bread pudding. Lightly spray a 9x13 baking pan with nonstick cooking spray; set aside. Cut each of the toasted English muffin halves in half crosswise. Arrange the English muffin pieces and Canadian bacon in alternating, overlapping layers in the prepared baking dish. Scatter the grated and cubed cheese evenly over the top. Whisk together eggs, milk, Dijon mustard, hot sauce, kosher salt, black pepper, granulated onion, and granulated garlic in a large bowl. Pour over the contents of the pan. Cover tightly with plastic wrap and refrigerate for 6 to 12 hours prior to baking. Place the 9-inch x 13-inch pan on another rimmed baking sheet and set on the counter while you preheat your oven to 350 degrees. Bake uncovered until puffed and set in the center, about 90 minutes or until an instant read thermometer registers 157F when inserted halfway into the center of the egg bake. If the Ham and Cheese Melt Egg Bake starts browning too much before it puffs in the center, cover the pan loosely with foil sprayed with non-stick cooking spray to prevent the top layer being scorched. Remove the pan from the oven and let it rest, removing the foil if you had to use it, for at least 10 minutes before slicing and serving. Store leftovers tightly covered in the refrigerator for up to a week. We made this and love it! My creative husband suggested adding potatoes to it and we did, sliced thin and par-cooked. Came out delicious. We made enough to last a few days and we are enjoying the ease of not having to think what to make when we are sleepy and kitchen-staggering around. We think next time we will chop up the canadian bacon, as the whole slices require having to use a knife. Just sayin’ – anything for making life simpler. Thanks! What an inspired addition with those potatoes! I love it! Thanks for letting me know you liked it! This was great. I had to cook longer for the custard to set. Next time I see half of receipt.